Folks, maybe it would be fun to "remember when" and stroll through those priceless memories that gave us some wonderful cowboy singing stars like Gene Autry, Roy Rogers, Eddie Dean, Jimmy Wakely, Rex Allen and Tex Ritter. Good friends, solid images for our youth and the granddaddys [sic] of our popular members of country music. 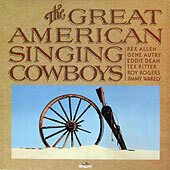 They're even more important today as they are the last of our GREAT AMERICAN SINGING COWBOY heroes. Hope you enjoy them.